Christmas Eve in uptown Charlotte, NC - a winning night for the Carolina Panthers. Engage your customer in your business with a virtual tour on Google Maps and your GYBO business listing. Contact Marc today to schedule your business virtual tour photo shoot at (828) 367-7570 or marc@webtechczar.com. Follow the railroad from Asheville east and you will find the quaint town of Black Mountain; brimming with shops and restaurants with Western North Carolina and global personalities. 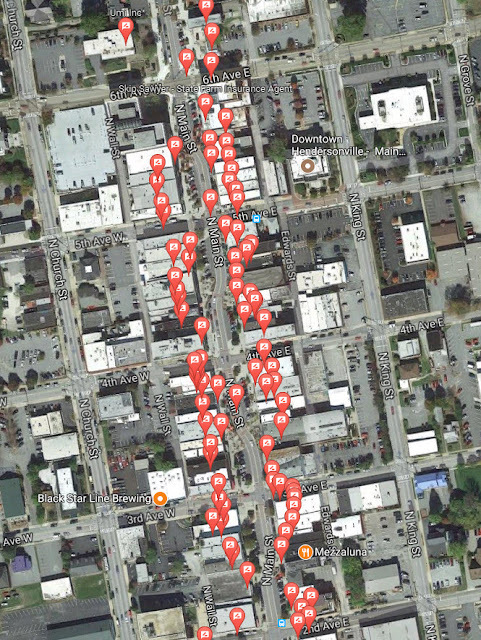 In Black Mountain, 360-degree storefront pictures were shot today at more than 100 businesses as seen on the map below of red pin-drops. If you are from a business, consider further immersing your customers into your business 24-7-52 with a spherical virtual tour from your local Google Street View Trusted Photographer. Let the potential customers see the inside of your store. And Black Mountain Town Square is a great place to take a rest and gasp at the views of the mountains and the small businesses as seen with the Huge Rockers below. Shop small, shop local, and let Asheville SCORE provide your business with free mentoring. Choose the business on the left or on the right? The business with a virtual tour wins! Consumers make decisions that usually start with a Google Search.A decision, the business on the left or on the right? If one had a Virtual Tour, it is likely the customer will choose the business site with a visual of the inside of the business.The consumer finds the business and plans their visit using Google Maps. Does your business have a Virtual Tour on your Google business knowledge card and Google Map listing? Customers make visual decisions on whether to go to the business on the left or on the right! December means parades and the Town of Weaverville held their 2017 Christmas parade today. 360sphere.biz captured the flavor of this town's main street small business with a sequence of storefront pictures with the parade on the main street. Call 828-367-7570 or email marc@webtechczar.com today to schedule your business's Google maps virtual tour. Locals and especially tourists - love to see a preview of a business and plan their shopping. A virtual tour engages these customers. 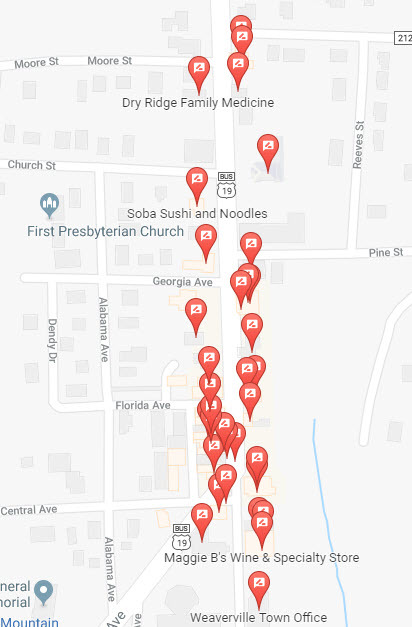 Google Search and Google Maps is a MAJOR marketing toolfor hyper-local businesses engagement To view the photo spheres below, use Google Maps pegman (lower right) on a desktop or on a smartphone, use the Google Street View App from Apple iTunes Store or Google Play. Call 828-367-7570 or email Marc today to schedule your business's virtual tour with a Google Street View Trusted Photographer. Major discounts are available when more than 1 business schedules a photo-shoot on the same day. A picture really is worth a thousand words. A virtual tour is worth so much more! Schedule your Google Trusted Photographer Virtual Tour photo shoot today. A 360-degree pictures captures the moment. A spherical view provides a view of all. The above 360 is an enagaging panorama of the individuals whom contributed to a recent technology event in Western North Carolina. Are you leveraging current tools to market your business or cause? Buncombe County including Asheville North Carolina is known as the 'Land of Sky.' It is a community of energetic people that build destinations towards the skies. To get to our destination, there are numerous bridges of accessibility. This bridge at the John B Lewis Soccer Field is a strong and commanding bridge with a separate walkway for non-vehicular traffic. Your small business also needs strong bridges. Bridges of connectivity for your existing and potential customers to see your products and/or services. Consider a 360sphere.biz virtual tour as an effective bridge to market your visit. Email Marc today to schedule your photo-shoot. A picture is worth a thousand words and 360-degree photography provides new views on your products or services. During Web Tech Czar's Facebook for Business class at Blue Ridge Community College, we'd talked how to post with not just text, but to include photographs to organically boost your content. The business world is competitive like a bald in the Appalachian Mountains is also competitive with only the strong plants surviving the wind and rain at higher altitudes. Let the flowers of success dominate your product or service with 360-degree virtual tours of your business surrounding. Contact Marc@WebTechCzar.com to schedule your virtual tour photo shoot today. You've got the 360-degree views of some awesome health and fitness equipment thanks to Park Ridge Health and Fletcher Parks. And there are a diversity of picnic tables and a large shelter that can be reserved. Powerful clouds with super green grass, and the batter's brown dirt. Yes, even our park's & recreation departments need to showcase our community assets. Fletcher Park is showcased with these 360-degree spherical pictures! Does the product power the image on this Google Street View picture? Get Your Business Online (GYBO) with Google and Google Street View Photography. Every festival needs Kettle Corn to be available for purchase! Stop at WNC Farmer's market (retail building A) and see Granny Gertie's Awesome selection of woodwork, including some awesome wooden puzzles, crafted and handpainted by Peggy Barnes, Owner. 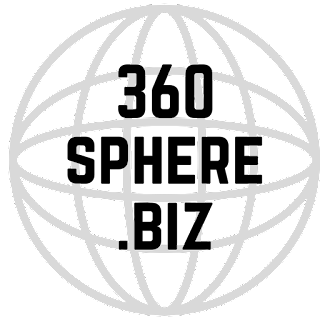 Please tell Jerry or Peggy that you saw their spherical picture online. Do you or your business want a new perspective on your surroundings? The above photograph is a JPG file without the spherical meta tag to view it as a 360 photograph. 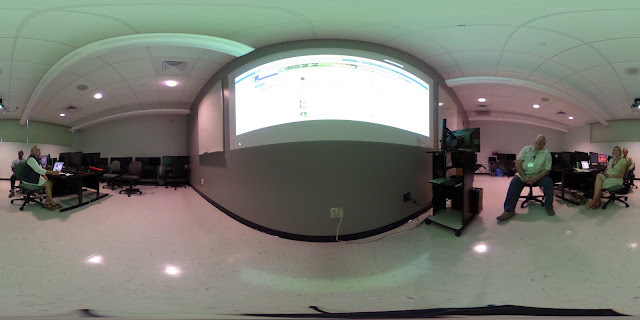 See the 360 spherical image here. Add fireworks to your business sales. Add 360 spherical photography today. Call Marc at 828-367-7570 or email marc@webtechczar.com. 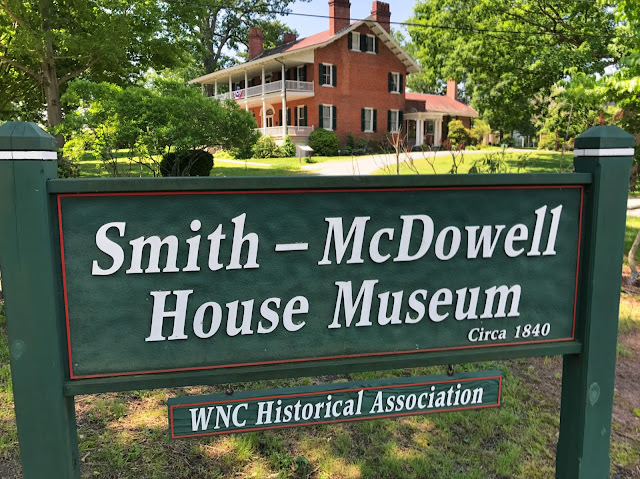 Asheville's Smith - McDowell House - Flat or 360 Picture Engagement? "constructed in 1840, it still remains the oldest mansion in Asheville"
See the more immersive image as a 360 spherical picture. 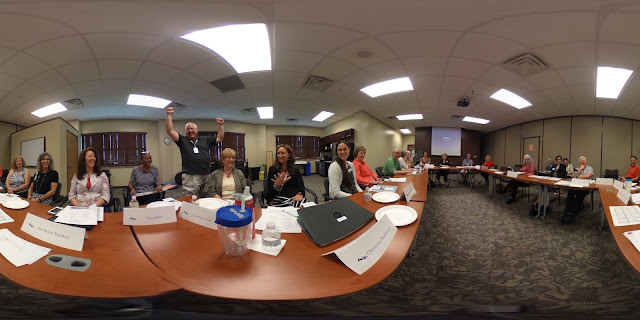 With unbelievably warm smiles, the Land of Sky Area Agency on Aging (AAA) and the Buncombe Aging Coordinating Consortium (ACC) was introduced to the Meet the Geek’s UnITeWNC.io Silver-to-Gold initiative by Marc Czarnecki on June 22, 2017. We can engage the expertise of our WNC 50+ demographic in educational and mentoring efforts, think tanks, and other areas where their experience and wisdom will contribute. Many thanks for their leadership on aging in Western North Carolina. Learn more about Google Street View Photography. Click on the image to view the spherical image view of Abby Roach. 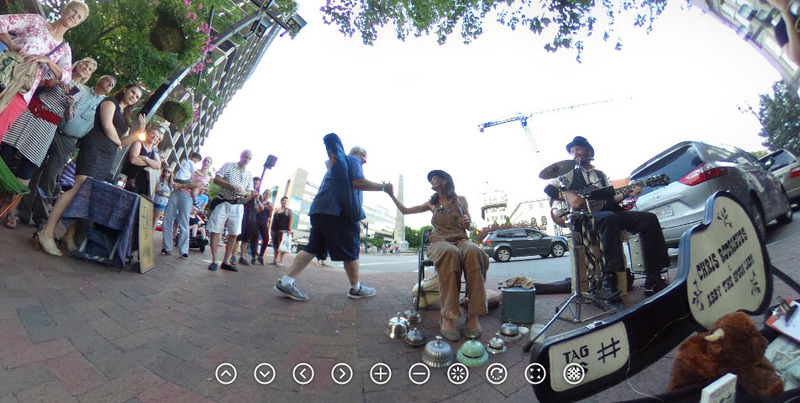 Also, select the 'auto-rotation' button to see a sample of the view from Abby's street performance view! Asheville and Western NC now have a new photography service available. Today we received official notice that Google will list us as an Asheville Google Street View Trusted Photography service. With the majority of consumers searching for business information, it is mission critical to have your business listing on Google's business information card. Current photography is important and Google wants to connect the inside of your business with Google Street view from the street into the business. 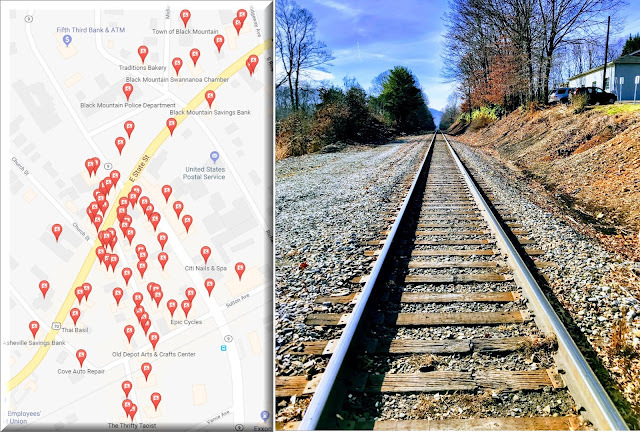 Schedule your Google Street View spherical 360 photography-shoot today by emailing Marc@WebTechCzar.com or call 828-367-7570. What is a spherical image? "in a differential geometry, the spherical image of a unit-speed curve is given by taking the curve's tangent vectors as points, all of which must lie on the unit sphere. The movement of the spherical image describes the changes in the original curve's direction." It's a milestone, yes, 360sphere.biz gets in excess of 50,000 views in three weeks of spherical image views. Travelers love the engaging view of a spherical photograph. Additionally, it is viewed 3-4 times more than a traditional flat business photograph. Get your business's spherical picture today. What is 360 Sphere Business? Photography maybe flat or it can be 360 degrees or a spherical view. Engage your customers into your business, real estate, hotel, etc. with 360 spherical photography. Hire a Google Street View Trusted Professional today. Contact Marc for your Google Street View photography needs today for Asheville and Western North Carolina.